Imagine a canvas of pure white sand and aquamarine blue, a picture perfect tropical paradise beach with the endless bowl of the blue sky replaced by the ocean. Into this starkly beautiful landscape a two- hour boat ride from Colombo, had sunk a small boat. Initially, it had probably sullied the pristine scene with its harsh man-made lines, oil and diesel leaking. 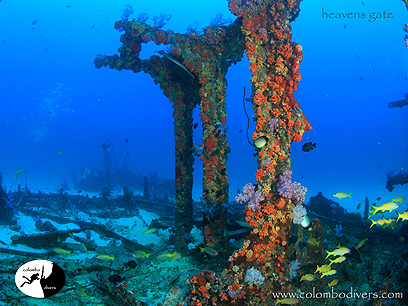 Time has however had smoothed this out and now it is heaven underwater, the rusted shell covered in green and pink soft corals and fish exploding in a kaleidoscope of colour out of every nook and cranny. An hour out by boat from Colombo Divers, the sun glittered off the waves as Ravindra the boatman positioned us over the tiny wreck. As we sank through waters with 30m-plus visibility, the rusted ship looked strangely abstract and as we got closer, amorphous. Nearing the bottom, the reason for the shape-shifting became obvious as an immense shoal of glassfish obscured the wreck, all moving as one. Literally pushing through the glinting shoal we moved over the sunken ship, settling down into the sand at the stern where the fish life was more languid but still diverse. An electric ray swam slowly into view while blue-lined snappers and fusiliers shoaled around us, a constant milieu of movement that was dazzling to the eye. 360 degree turns in the shoal, enjoying the sunlight arching through the thousand translucent fish. As the light glittered and splintered through them, bliss overcame me, 30m down in heaven.